The bathroom can sometimes become a somewhat neglected part of the house, with not many of us really thinking to add our creative flair to the space. It can be difficult to know how to upgrade our bathroom to bring it to the next level, but it's really not as hard as you may think. Sure, you'll need to save up some money for the project, but it will be worth it when you have a relaxing room to be proud of! Bathroom storage can be tricky, particularly if you don't have much room to work with. But there are some clever ways to store your bath products and cosmetics without too much fuss. One excellent idea is to purchase a fruit basket and stand it next to your bath, that way you can keep all of your bath bombs to hand. One of the easiest ways to spruce up a tired looking space is to add some lovely artwork. Of course, it is advisable to laminate any paper artwork you want to hang up to protect it from steam, but it's still an adorable way to brighten up your bathroom. When you are getting into the bath or the shower, you might want to take off your jewelry and leave it on the counter, but a better way is to find a small decorative plate which matches the theme of your bathroom and place them in there! You could even use the plate as a tealight holder. This idea is one of the most creative in this list. No one ever really thinks to add shelves to the bathroom, for whatever reason it always seems to be overlooked. Why not take a lovely piece of wood and repurpose it into a shelf? You can put plants, products or even candles on there. It will instantly add a layer to the design. The worst thing to walk into in a bathroom is products all over the side of the bath. It's messy, ugly and can make the room look so much smaller. Try storing items in a tallboy cupboard if you don't have a lot of space in the bathroom. It will make such a huge difference! The Bath is the centerpiece of your bathroom, which is why if you want to upgrade your bathroom, replacing your bath truly is an essential thing to do. There are so many different shapes, size and colors of bath you can choose. From large, round ones to freestanding copper ones. If you are looking for a new bath, take a look here: https://www.tapwarehouse.com/ for some inspiration. 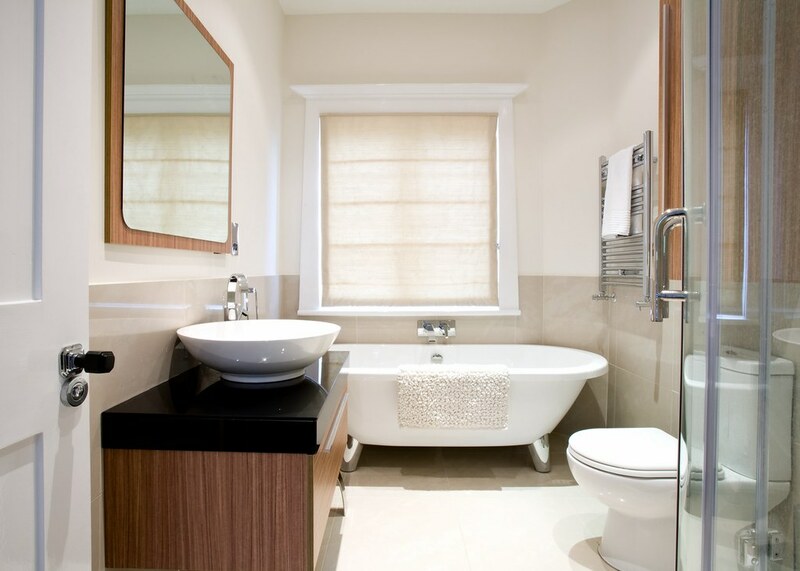 Towels are the lifeblood of the bathroom, and can instantly add an element of fun and personality to the room. Choose a color that you love, which is bright and fun. It will make a huge difference when you hang them up on the towel rack. Another solution to your storage woes, particularly for makeup and cosmetic products is to take a cutlery organizer and place it in one of your bathroom drawers. This will instantly make your drawer look tidier and make it so much easier to find your bobby pins. Radiators can be an eyesore, but you can find some great ones online which don't take up too much space and detract from the overall feel of the room.